1). The Newhaven Chalk exposed in sea-cliffs at Telscombe Cliffs, near Peacehaven, East Sussex. 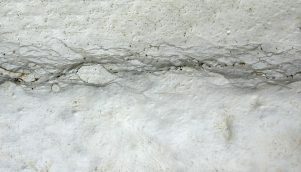 The image above shows a typical section through the British Chalk; an apparently featureless white limestone with repeated seams of flints. Chalk deposition spanned 30 million years, and both Britain and the globe were subject to changes in climate, sea-level, ocean chemistry and marine life during this period. However, the nature of the chalk sediment means that such changes were poorly recorded. There was virtually no input of land-sourced clays or sands, and the planktonic ooze which accumulated instead was very uniform in grain-size, composition and colouration. Despite this, the Chalk Group can still be divided into recognisable units on the basis of several different schemes; Lithostratigraphy, Biostratigraphy, and Chronostratigraphy. Lithostratigraphy - vertical changes in lithology (rock type). At first glance all Chalk exposures appear similar, and relative to other rock sequences the chalk is pretty homogenous. But there are countless marl (clay) bands and flint seams, many of which can be traced for hundreds of miles, that can be used as lithological boundaries. These boundaries allow the chalk to be split into various Formations and Beds; units of rock with similar lithological character. For example, the Seaford Chalk Formation is a unit of pure, soft white chalk with flints situated between Shoreham Marl 2 and Buckle Marl 1. By contrast the West Melbury Marly Chalk Formation is a unit of impure chalk with thick marls and lacking flints. This is largely a localised scheme; the Formations differ even within the British Isles, and are certainly very different for regions outside of Europe. Lateral differences in lithology reflect varying sedimentary and tectonic processes at the time of deposition. (Lithological Features). Biostratigraphy - vertical changes in fauna. The types of fossil found within the Chalk can vary greatly from one horizon to another. This reflects the way the fauna in any one region varied with time; by evolutionary processes and / or due to changes in environment. It is also influenced by changes in preservation style, e.g. though ammonites are commonly found in the Grey Chalk they are rarely preserved in the White Chalk. Certain fossils are present for distinct intervals within the chalk and can be used as zone fossils. In general terms this is a global scheme (e.g. chalks containing Uintacrinus socialis can be found in both Europe and America), but a zone fossil need not necessarily be present worldwide or in all sedimentary rock types. Chronostratigraphy - true or relative time. The Late Cretaceous Period is divided into various stages, whose age and duration can be accurately estimated in millions of years. By intergrating chronostratigraphy with biostratigraphy, zone fossils in effect become ways of dating the rocks (e.g. a rock containing Marsupites testudinarius will be the same age as all other rocks containing that fossil; around 84 million years old). Though lithostratigraphy is broadly related to time (e.g. Late Cretaceous rocks from around the world often contain chalks) this is not necessarily the case on a localised scale. Nevertheless, the various marl and flint seams of the Chalk Group form effective 'time-lines' of equal age across the British Isles. Against the pure white backdrop of the chalk, certain lithological features are very distinct. Most striking are the flint seams of the White Chalk, but there are also marl seams, phosphatic horizons, and secondary mineralogical features such as pyrite / marcasite nodules and various calcitic crystal growths and speleothems (e.g. stalactites) developed within voids. Occasional erratics are also encountered. 2). Nodular flint seam, Newhaven Chalk, Telscombe Cliffs, near Peacehaven, Sussex. Flints occur within the White Chalk and are typically concentrated into horizons. 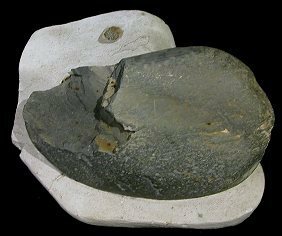 They formed as concretions of silica, sourced from sponges and siliceous plankton, which was soluble on the sea-floor but re-precipitated within the sediment. 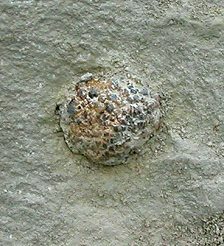 Nodular flints tend to follow the course of burrows or are found infilling and enveloping the shells of dead organisms such as echinoids. 3). (A) Sheet Flint; these occur as layers parallel to bedding, or within fractures and fault networks. (B) Marl seam; concentrations of clay form conspicuous seams within the chalk, some of which were formed by the ash fall-out from volcanic eruptions. 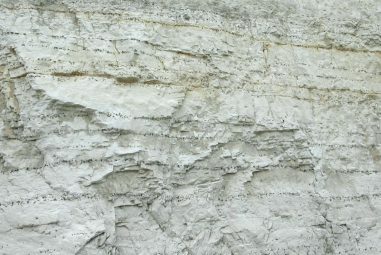 The Grey Chalk is coloured by its clay content and reflects the lower sea-levels, and hence greater extent of land from which clays were sourced, at the beginning of chalk deposition. Much of the Grey Chalk is comprised of alternating marly-chalk and clay-poor chalk. The remainder of the Chalk, the White Chalk, was deposited whilst sea-levels were extremely high and the majority of NW Europe was flooded. The purity of the White Chalk resulted from the virtual absence of land sourced sediment. (A, B) Both Newhaven Chalk, Telscombe Cliffs, near Peacehaven, Sussex. 4). 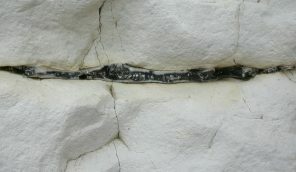 Iron sulfide nodules (Marcasite / Pyrite) are frequently encountered in the Chalk, particularly the Grey Chalk, and are often found in association with fossil material. 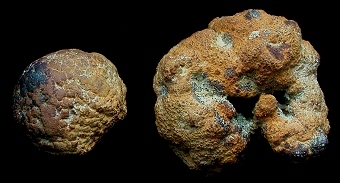 Exceptionally preserved specimens from the Grey Chalk, particularly fish and starfish, are often partly overgrown by nodules. 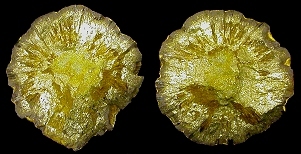 (A) Nodule in situ in an exposure of Grey Chalk; (B) typical nodules; (C) a freshly spilt nodule displaying the striking gold colouration which explains the common name of 'Fool's Gold'. All x1.0, Grey Chalk, Abinger Hammer, near Guilford. 5). Calcite crystals, x2.0, Grey Chalk, Cow Gap, near Eastbourne. Voids within the Chalk, such as fractures or with brachiopod and echinoid shells, are often the site of secondary mineral growth. 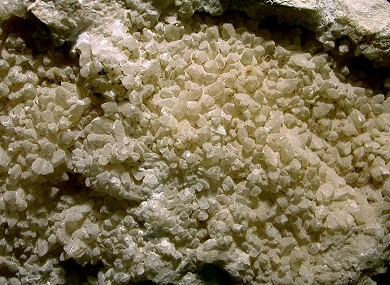 Typically this takes the form of euhedral calcite crystals. Larger voids and minor cave networks may develop speleothem structures such as stalactites. 6). Occasional erratics occur within the British Chalk. These apparently land-sourced pebbles, cobbles and boulders are problematic, and may have a number of origins; some may have been rafted out to sea from nearby land caught in the roots of dead trees, others may represent gastroliths; stomach-stones swallowed by marine reptiles. (Examples). The table below is a review of the Chalk Group lithostratigraphy and biostratigraphy in the context of Late Cretaceous chronostratigraphy. MORTIMORE, R. N., WOOD, C. J., and GALLOIS, R.W. 2001. British Upper Cretaceous Stratigraphy, Geological Conservation Review Series, No. 23, Joint Nature Conservation Committee, Peterborough (558 pages). MORTIMORE, R. N. 1997. The Chalk of Sussex and Kent, Geological Association Field Guide No. 57, Geologist's Association, London (193 pages). MORTIMORE, R. N. 1986. 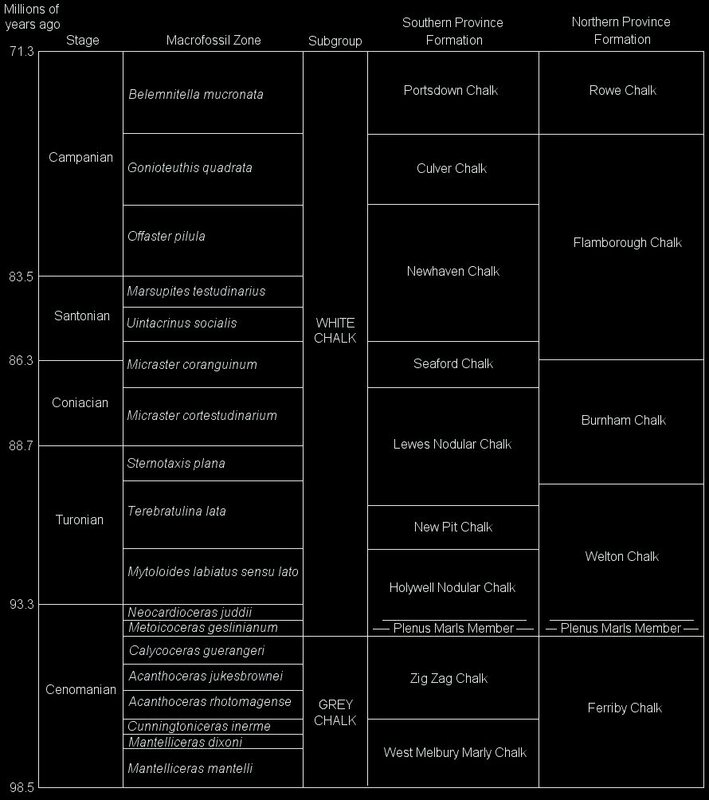 Stratigraphy of the Upper Cretaceous White Chalk of Sussex, Proceedings of the Geologist's Association, London, 97, 97-139. ROBINSON, N. D. 1986. Lithostratigraphy of the North Downs, southeast England, Proceedings of the Geologist's Association, London, 97, 141-170. GASTER, C. T. A. 1951. The Stratigraphy of the Chalk of Sussex, Part IV: East Central Area - between the valley of the Adur and Seaford with zonal map, Proceedings of the Geologist's Association, 62, 31-64. GASTER, C. T. A. 1944. The Stratigraphy of the Chalk of Sussex, Part III: Western Area - Arun Gap to the Hampshire boundary with zonal map, Proceedings of the Geologist's Association, 55, 173-188. GASTER, C. T. A. 1939. The Stratigraphy of the Chalk of Sussex, Part II: Eastern Area - Seaford to Cuckmere Valley and Eastbourne with zonal map, Proceedings of the Geologist's Association, 50, 510-526. GASTER, C. T. A. 1937. The Stratigraphy of the Chalk of Sussex, Part I: West Central Area - Arun Gap to valley of the Adur, Proceedings of the Geologist's Association, 48, 356-373. ROWE, A. W. 1929 (posthumously). The Zones of the White Chalk of Lincolnshire, Naturalist, 875, 411-439. GASTER, C. T. A. 1924. The Chalk of the Worthing District of Sussex, Proceedings of the Geologist's Association, 35, 89-110. ROWE, A. W. 1908. The Zones of the White Chalk of the English Coast, V: The Isle of Wight, Proceedings of the Geologist's Association, 20, 209-352. ROWE, A. W. 1904. The Zones of the White Chalk of the English Coast, IV: Yorkshire, Proceedings of the Geologist's Association, 18, 193-296. JUKES-BROWNE, A. J., and HILL, W. 1904. The Cretaceous Rocks of Britain, volume 3: The Upper Chalk of England, Memoir of the Geological Survey of the United Kingdom, HMSO, London (566 pages). JUKES-BROWNE, A. J., and HILL, W. 1903. The Cretaceous Rocks of Britain, volume 2: The Lower and Middle Chalk of England, Memoir of the Geological Survey of the United Kingdom, HMSO, London (568 pages). ROWE, A. W. 1903. The Zones of the White Chalk of the English Coast, III: Devon, Proceedings of the Geologist's Association, 18, 1-151. ROWE, A. W. 1901. The Zones of the White Chalk of the English Coast, II: Dorset, Proceedings of the Geologist's Association, 17, 1-76. ROWE, A. W. 1900. The Zones of the White Chalk of the English Coast, I: Kent and Sussex, Proceedings of the Geologist's Association, 16, 289-368.